Highly affordable Brit-made electro that comes beaten up and bruised if you want. Not for everyone, but has undeniable mojo. Intonation and tuning stability is good. Rough looks and crisp tones will delight blues fans. Nice price. Won't be to all tastes. Thin nut width. Lovers of pristine new instruments, please look away. Nineboys has really excelled itself with this pre-war parlour-style electro that looks, in its Black Wear finish, completely knackered. "The Suffolk-based maker has clearly been on the ol' Moonshine"
It ranks among the oddest specimens we've ever reviewed, arriving in its unfinished plywood 'crate' case with plastic-shrouded rope handles and a single wing-nut fastener. If that's not enough, it has one of the chunkiest necks we've encountered, a deep 23.7mm at the 1st fret and a whopping 28mm by the 8th. The Suffolk-based maker has clearly been on the ol' Moonshine. Its take on the stringed instrument is decidedly non-mainstream, and aimed at the Seasick Steves of this world: roots music tools for gnarly bottleneck blues. But they're also made in the UK and highly affordable. Nineboys' new brand, Tonk Bros, takes its name from a Chicago-based musical instrument distributor that started out in the early- 1900s. By 1939, Tonk Bros claimed to be the "world's largest exclusive wholesalers of musical merchandise", with a catalogue that included Washburn, National and Weissenborn, not to mention tenor guitars, mandolins, banjos and ukuleles. 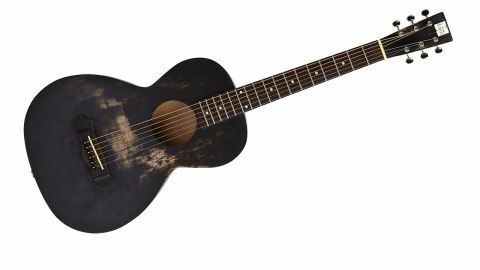 While this parlour might be modelled on those pre-war small-body steel strings, it employs an unusual internal construction - a key to its lowly price. Made exclusively of sustainable birch ply, along with a multi-laminate bolt-on neck, the bracings and linings are CNC machined - effectively a one-piece 'frame' for the top's X-bracing and linings, and another piece for the back. You might remember Chris Griffiths' guitars: they used a similar 'frame' construction, although their frame was moulded from plastic. More conventional is the small Martin-like headstock and fancy-ish looking rosewood bridge with additional-piece outer 'feet'. We also get an adjustable truss rod - though with a neck this big that seems rather over-engineered. Innovative it may be, but it seems a bit over-built, and consequently is quite quiet compared to a small-body guitar such as Taylor's GS-Mini. "Intonation is extremely good thanks to accurate fretting and a compensated bridge saddle"
That said, the sound has a nice midrange push and slightly tight bass with crisp highs - a typical 'blues' sound that's not a million miles away from an old-style laminated acoustic archtop. A slightly broader nut width wouldn't go a miss, although the bridge spacing is good and it's very stable. We rarely touched the tuners, and intonation is extremely good thanks to accurate fretting and a compensated bridge saddle. There's sufficient upper-position 'air' for slide, though lower positions need a nut riser. Plugged in, the passive under-saddle pickup, with no onboard controls, produces a usable, slightly piezo-ish, but not overly 'processed' electro sound into a small PA. With a little dirt and gain thrown in, it works plugged into a Fender combo, too. Clearly not for everyone, you really have to 'get' the Nineboys ethos: it's all about character. That said, anyone who can produce a UK acoustic at this price should be applauded, and if you want to play roots blues, it's well aimed.